Roger Wright's recently announced move from the BBC to Aldeburgh has been described elsewhere as a "bombshell" and "surprising"; but personally I would describe it as another predictable step in the remorseless suburbanization of classical music. Roger Wright has not left the BBC: he has been moved sideways by the music establishment to a "safe house" at Aldeburgh. As has previously been pointed out here, the chairman of Aldeburgh Music council Simon Robey is also chairman of the Royal Opera House, while Aldeburgh Music president Lord Dennis Stevenson of Coddenham is a director of Glyndebourne productions as well as listing consultancy to Universal Music in his parliamentary declaration of interests. Their colleague Laura Wade-Gery sits on both the Aldeburgh Music council and the Royal Opera House board of trustees, another Aldeburgh Music council member David Robbie is a former non-executive director of the BBC, and the Barbican Arts Centre is run by Roger Wright's predecessor at the BBC Nicholas Kenyon. This nepotistic network spans both creative and commercial interests, and some of the most intense personal pressure I have been subjected to in almost ten years of blogging came when Aldeburgh Music unsuccessfully tried to force me to redact a factually correct and diligently cross-referenced post about funding from a multi-national corporation. Coverage of Roger Wright's move sideways has been, like most current musical journalism, lamentable. Little attention has been paid to new BBC director general Tony Hall's "vision" statement for the arts which was made the day after the announcement of the departure of his classical music network controller; a statement which, I suspect, was a step too far towards suburbanization for even Roger Wright. Most of the coverage by journalists eager to stay onside with the BBC has positioned Tony Hall as a force for good. Which conveniently overlooks that the newly appointed director general spent 28 years immersed in the bloated culture of the BBC before moving to the Royal Opera House. At Covent Garden one of his achievements was to fill the foyers with masters of the financial universe braying into mobile phones and another was to allow young singers to be sponsored - quite unbelievably - by a tobacco company. In a sycophantic piece in the Telegraph Radio 3 presenter Ivan Hewett says Roger Wright is "off to run the Aldeburgh Festival". Which is somewhat simplistic: he has been appointed chief executive of Aldeburgh Music, an organisation responsible for activities ranging from education and outreach to residencies, new music commissions, and experimental events such as Faster Than Sound, as well as the Aldeburgh Festival. Aldeburgh defines itself as "a place of energy and inspiration for music and the arts". That energy and inspiration can only come from an animateur who is prepared to cross swords with the establishment, which is not something Aldeburgh Music's chief executive designate is exactly noted for. Seen above is one of the houses that Roger Wright - annual BBC remuneration £227,450 plus generous expenses - may be viewing in anticipation of his move. 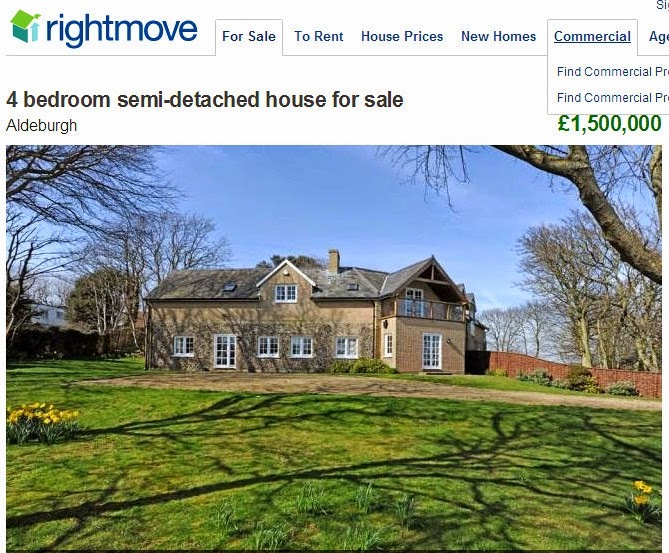 For readers outside the UK I would explain that "semi-detached" means it is part of a larger establishment, and the sterling 1.5 million price tag - which is typical of suburbanized Aldeburgh - converts to US dollars 2.5 million. Forgive me if I lapse back into silence.